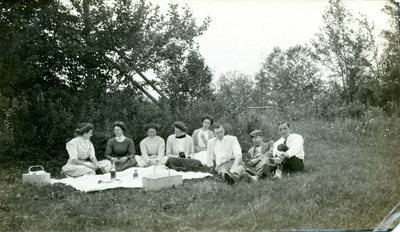 "University of Maine Students Hosting Picnic "
An image scanned from a black and white photograph of several people having a picnic, presumably in the area of Orono, Maine. Saved within a scrapbook of a member of the University of Maine Class of 1911. A handwritten caption notes, "Faye Tarbox on extreme left. All others were a party up from Machias for the day. The fellow next to me is Geo. Tarbox, Maine '06."